Frasers Commercial Trust - Google to Save the Day? Committed occupancy at Alexandra Technopark to potentially reach 100% should Google take up space at Alexandra Technopark. Overhang over FRASERS COMMERCIAL TRUST (SGX:ND8U) from fears of its inability to back fill space vacated HP should recede. Maintain BUY and Target Price of S$1.70. According to The Business Times, Google is in advanced negotiations to lease 400,000 sqft of space at Alexandra Technopark (ATP). Currently Google occupies 500,000 sqft at the nearby Mapletree Business City II (MBC II) and will be expanding its space requirements by leasing additional space at Alexandra Technopark. As at 30 September 2018, committed occupancy at Alexandra Technopark stood at 70.2% with HP vacating another 93,195 sqft of space in December 2018. If Google does take up 400,000 sqft of space at Alexandra Technopark, and assuming FRASERS COMMERCIAL TRUST (SGX:ND8U) had signed up other tenants, Alexandra Technopark will be close to fully occupied. In terms of signing rents, according to a Business Times article, Google could be paying S$4 psf/month in line with recent signing rents at Alexandra Technopark, as compared to S$6 psf rents at MBC II. Following the publication of the Business Times article, Frasers Commercial Trust clarified that it is in discussions with various prospective tenants but did not confirm that it was in discussions with Google. See Frasers Commercial Trust's announcement dated 17 Jan 2019. 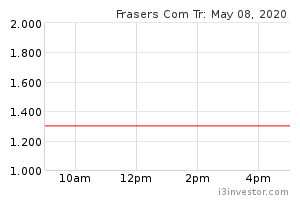 Frasers Commercial Trust’s share price has been depressed over the last couple of years, trading at 7% yield. This is 2% higher than other large-cap office REITs, vs the historical average spread of 1%, due to concerns over the ability of Frasers Commercial Trust to back fill space vacated by HP despite conducting a S$45m AEI. HP used to take up slightly over 0.5m sqft of space at Alexandra Technopark which had 1m sqft of NLA. If Google is indeed moving into Frasers Commercial Trust, we believe the cloud hanging over Frasers Commercial Trust will finally be lifted. We reiterate our BUY call and Target Price of S$1.70.